Love Is Always Right empowers you, in the midst of difficult decisions, to do the right thing ... every time. There is one standard you can use in every circumstance to virtually guarantee that you will do the right thing ... every time. 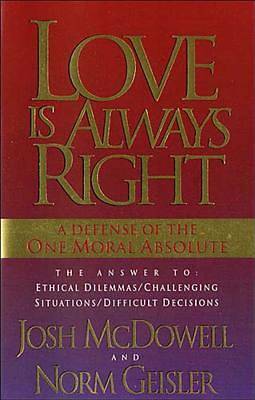 In Love Is Always Right, Josh McDowell and Norm Geisler reveal the "test of love" an easy to understand and even easier to apply principle that will help you make right choices while discovering God's will. Theologically, say the authors, telling right from wrong begins with understanding that the essential nature of God is love. Josh and Norm build on this foundation to develop a step-by-step decision making plan you can apply to every situation. With numerous examples, Josh and Norm show how from the complex ethical dilemmas to the every-day stuff of living, we can have a steadfast compass for solving the most difficult decisions of life.